Barbis Ruder Performance "DU aber eigentlich geht es um mich"
Three bodies to be seen, three voices to be heard, three egos to be realised in the You. 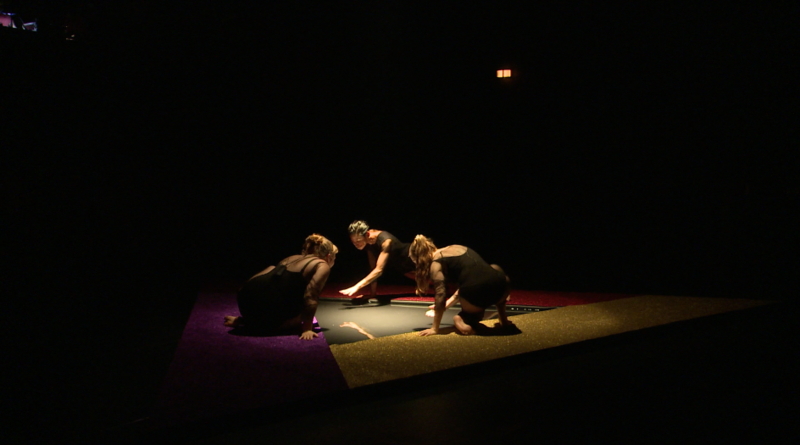 DU, a three player performance by Barbis Ruder, is a theatrical impossibility. The arena of self-realisation is a triangular pond in the middle of a modestly lit WUK theatre. Faced by two audience fronts, the trio scuttles, waddles, and poses for life. We never get to see the whole story. At first, the performers’ plasticky faces are frozen mid-sentence. Arms swinging for life. One choreography, three unique bodies, waving for attention during an extended intro. But soon enough it’s mouth time: Apologies, Thank yous, and pleas for love are poured out in search of a listener. Echoes are heard, but attempts to understand are futile. “Where are you now?” Pop lyrics which resonate in a beautifully brutalised German interpretation. The preliminary answer: We’re at the pond, pondering our selves, trying out collective identity, aggressively frolicking in our shallow waters. And: we can have important dramatic monologue about chewing gum. The I can’t have you, but it can chew. In the end, the you is still an unconfirmed idea. 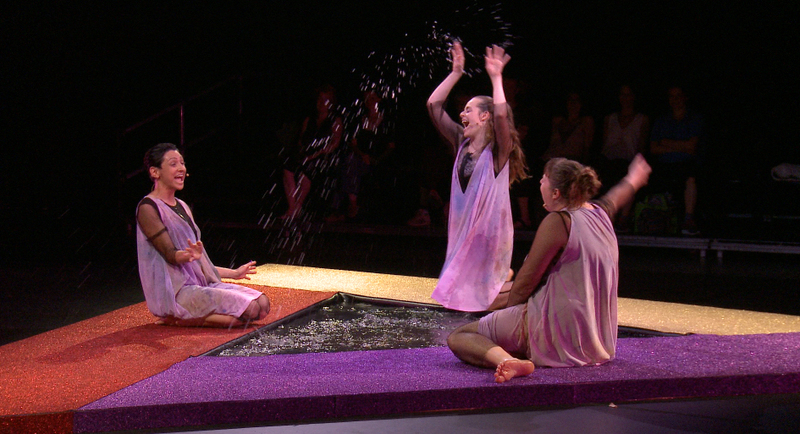 But the spectacle of finding it has been a captivating ride: Barbis Ruder, Stefanie Sourial, and Veza Maria Fernandez maintain a breathtaking tension, as they navigate through changing power dynamics, alliances, settings, and genres. Seamlessly, they move from desperation to silliness, from humming to screaming, from nymph ballet to apology techno. As the tough, the sweet and the sturdy, they ask a terrifying set of questions: What if attempts to hear each other will always be doomed? What if the you is impossible? In this case, let’s just frolic at the pond.